The leader of Russian women's ice-hockey team Alexander Vafina told about team’s long-awaited medal at the Women's World Championship and fights in women's hockey. Alexandra Vafina, leader of the Russian women's national ice-hockey team, speaks with Moskovskie Novosti about how she got into the sport and what the team’s long-awaited medal at the Women's World Championship means to them. Moskovskie Novosti: Alexandra, winning bronze at the World Championship came as a pleasant surprise for many of your teammates. Alexandra Vafina: I still can't believe we did it! Believe me, it's almost the same as winning gold for us. We had been trying to win medals in vain for 12 years before this year. MN: Can you explain why? A.V. : There's no one answer. After the success of women's ice-hockey in the United States, Canada and Europe, the sport started gaining momentum, while we lagged behind. To be more precise, we remained where we were and started losing ground to other teams as they moved forward. A.V. : The attitude toward women's hockey is quite different in North America. I could feel it as soon as I moved across the ocean. They hold inter-university championships with quite a lot of teams taking part. They also have a professional league where university graduates play. Competition is very high. Finland and Sweden, too, have some serious tournaments. Our national championship, on the contrary, does not show a high level of competition. 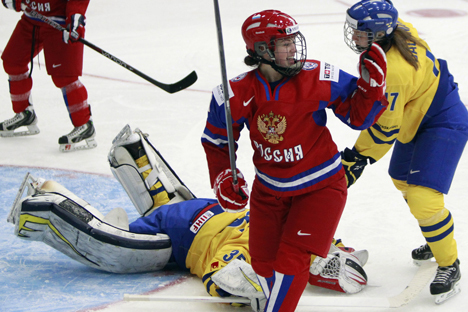 In addition, Russia also lacks the right attitude toward women's hockey. MN: What do you mean? A.V. : When I tell anyone in Russia I am a hockey player, I get a look of surprise. People are still simply unaware of women's ice-hockey, although it has already become an Olympic sport. MN: What about America – are they surprised when you tell them there? A.V. : I'm studying at the University of Minnesota, and when I tell someone I've just met that I play hockey, I don't see the panic in their eyes. “Hockey? Great, good job!” People love sports in the United States. They are not biased against hockey as a predominantly male sport. It's not the same in Russia. 1. Nine teams took part in the recent national championship, which was won by Tornado from Dmitrov (a town in the Moscow region). Since the first championship in 2005, Tornado has won the tournament six times. 2. Next season, as many as 11 teams are likely to participate, with new teams emerging in the Moscow region and St. Petersburg. 3. The Russian Superleague has no teams from Moscow. 4. Tornado took 48 wins out of 48 matches with 503 goals, allowing a mere 45 goals. 5. Tornado captain Yekaterina Smolentseva scored 102 goals and made 77 assists in 48 matches. A.V. : I hear this question all the time! But, you know, it wasn't entirely my decision. I didn't like the game at all to begin with, but my parents insisted that I continue. I am now very grateful to them that they were so adamant about this. MN: Many children's hockey coaches in Moscow are against having girls and boys practice together. A.V. : Personally, I think that having girls and boys practice together is the best option. Young girls generally develop faster than boys. Boys do not catch up with them up until 12 or 13. I think it's beneficial for girls to play with boys to improve their skills. MN: Do you have fights in women's hockey? A.V. : Fights are very rare at the international level – I can't even remember one. Even in university championships, it is more like an exception rather than the rule. We get very serious penalties for fisticuffs. Women's hockey fights are also very different from men's. Girls don't take their helmets off – or gloves, for that matter. There may be a little bit of pushing, a few knocks on the helmet, and that's about all. But again, fighting is very uncommon. MN: Do you agree that women's ice-hockey isn't very interesting to those who like men's ice-hockey? A.V. : They’re two different sports. The speeds are different. However, when you watch the U.S. or Canadian national teams, you may forget that it's women's hockey. MN: Do they show women's ice-hockey matches on TV? A.V. : They don't in Russia. It is our dream that at least some matches will be shown on TV. Hopefully, the bronze medals we've won will help. MN: You are currently dating Traktor player Nikita Nesterov. What's his take on your being an ice-hockey player? A.V. : I'll tell you a secret: Many girls in my sport date ice-hockey players. What's wrong with that? We share quite a few topics and interests. Also, athletes tend to be more OK about what we do. MN: You will each get $20,000 for your bronze medal at the World Championship. Is it a considerable sum for you? A.V. : It's good money, I must admit. But no one talks money on the national team. MN: It's not about that. A top KHL player has no reason to be concerned about his financial future by the time he retires from the sport. This is not the case with women's hockey, is it? A.V. : Well, certainly not. It would be impossible in women's ice-hockey to live off your savings after your career's over; ­we're talking about completely different sums of money. I can't even say we are anywhere close to men in this respect. So girls have to take their education seriously. Things happen. Anyone can get injured – what to do then? And, furthermore, we will have to find something to do after we end our careers.